The new Making for Change Showcase, from the White House Office of Science and Technology Policy, was announced at the 5th White House Science Fair on Monday, March 23, 2015, and hopes to encourage hands-on STEM learning, facilitate entrepreneurship and expand advanced manufacturing capabilities here in the U.S. The White House reached out to SparkFun for involvement in February 2015, and the company donated the kits and hardware to equip many of the student teams as they begin their prototypes. 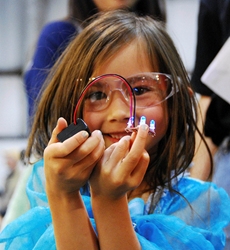 Diamond’s presence at the Science Fair reinforces SparkFun’s ongoing commitment to improving access to and interest in STEM education initiatives nationwide. The annual White House Science Fair celebrates the student winners of a broad range of STEM competitions across America. This year’s White House Science Fair included a focus on diversity and inclusion in STEM.